Ellen works full time so can’t commit to volunteering in the warehouse – but she is no less of a hero, having run a half marathon fundraising for FareShare. After visiting the FareShare London warehouse, Ellen was inspired to help solve an environmental problem with a social solution. Though a lot of our volunteers help out in the 21 Regional Centres across the UK, for those working full time this might be tricky. But there are plenty of other ways to join our mission, and Ellen decided to give us a hand as a Community Fundraiser. 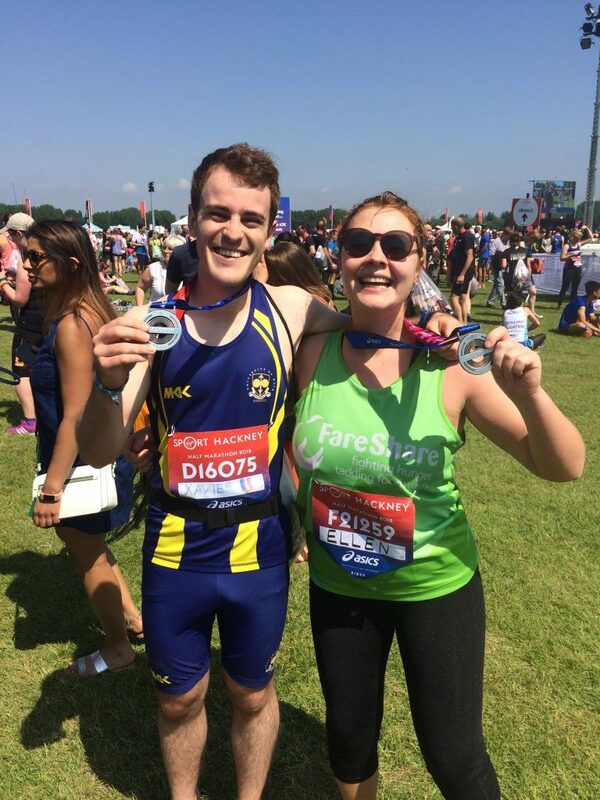 She told us about an incredible challenge she set herself – running a half marathon – and how it gave her an opportunity to educate her friends and family about FareShare and raise some much needed funds for our work. Why did you want to volunteer for FareShare? My previous job brought me to one of FareShare’s warehouses as a visitor, so I had an opportunity to see what you do: I was absolutely amazed by the way you tackle both food poverty and food waste, and how many people you help. I was really keen to help FareShare feed even more people, but because I work full time, I wouldn’t be able to commit to regularly helping out in the warehouse. That’s why being a Community Fundraiser is perfect for me – I can take my own initiative and support this great work when it fits my schedule. What have you done so far as a Community Fundraiser? I always wanted to challenge myself to run a half marathon, and I thought: why not do it while fundraising for a good cause! There are so many great charities out there, but I really wanted to support one that’s not as well known – and that’s why it came as a perfect opportunity when I became aware of FareShare. I wanted to do something locally so I signed up for the Hackney Half Marathon. It was really tough – it was a very hot day and I’m not a natural runner. But I loved spreading awareness about FareShare in this way, educating my friends and family who kindly sponsored me, and talking to people at the event too. At one point of the half marathon, I was exhausted so I started walking, and a runner sped past me. 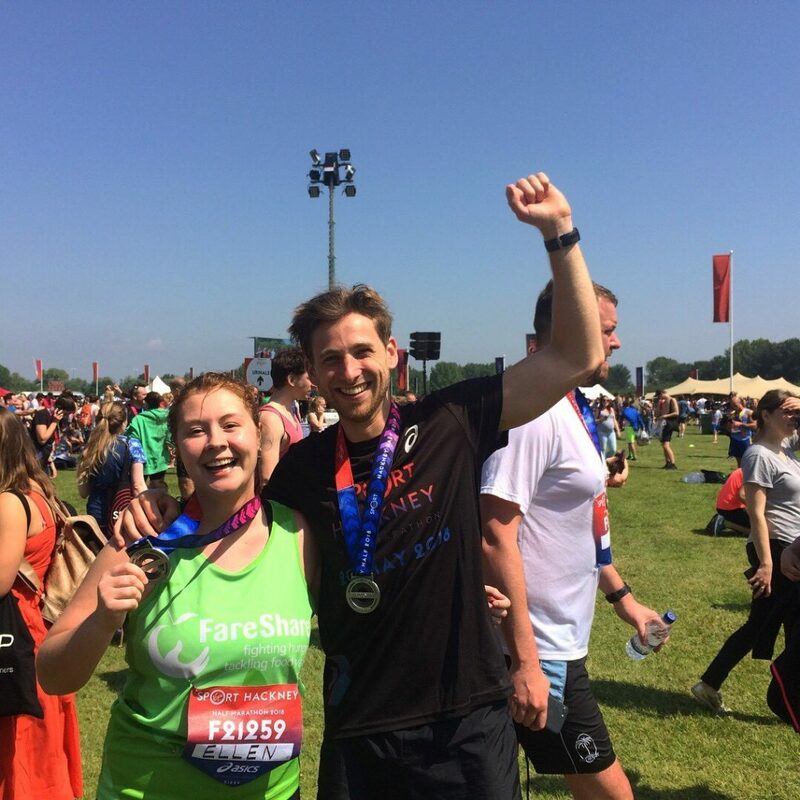 Seeing my FareShare shirt, he gave me a pat on the back and said: “I know FareShare, they’re great!” That was actually one of the highlights of the day for me and really gave me the motivation to keep going and complete the challenge! Would you recommend this kind of volunteering to others? I was very proud of myself for finishing the half marathon, and raising funds for such a worthwhile cause made the blisters worth it! But next time maybe I’ll try a 10k run instead, or a bake sale. 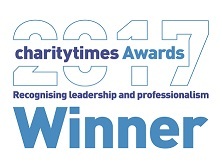 But whatever you choose to do to fundraise, it’s incredibly fulfilling and a great experience introducing people I know to the charity and getting them engaged. 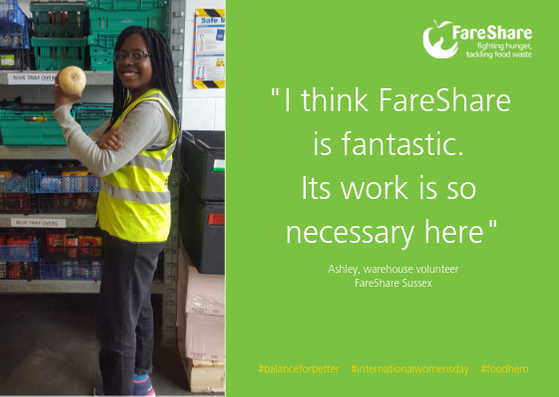 Today we’re sharing another story from the women of FareShare and today it’s Ashley, a warehouse volunteer from FareShare Sussex. 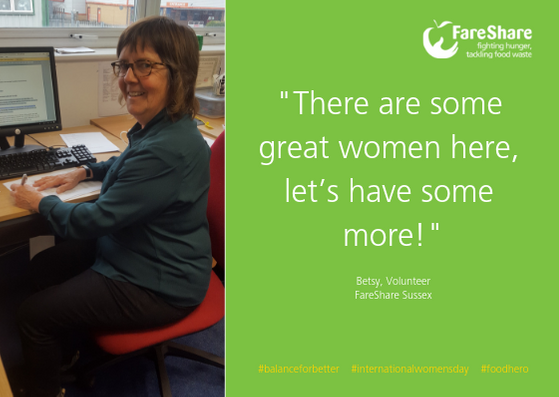 Throughout this week, we’ll be sharing stories from women who are working to make a difference across the charity, from volunteering in the FareShare Regional Centres, to heading up our national campaigns. 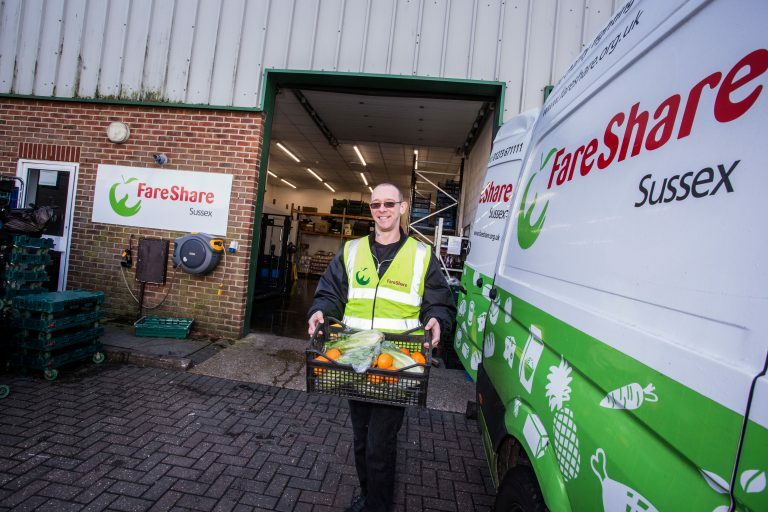 Steve’s volunteering with FareShare Sussex helped him land a driver position with the Regional Centre, a new role created thanks to Asda funding.